The Double Irish is a base erosion and profit shifting ("BEPS") corporate tax tool, used mostly by US multinationals since the late 1980s, to avoid corporate taxation on most non–U.S. profits. [a] It is the largest tax avoidance tool in history and by 2010, was shielding US$100 billion annually in US multinational foreign profits from taxation,[b] and was the main tool by which US multinationals built up untaxed offshore reserves of US$1 trillion from 2004 to 2018. [c][d] Traditionally, it was also used with the Dutch Sandwich BEPS tool; however, changes to Irish tax law in 2010 dispensed with this requirement for most users. 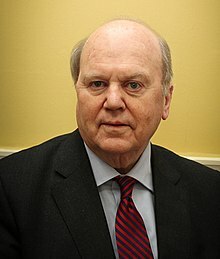 Former Finance Minister Michael Noonan closed the Double Irish BEPS tool to new entrants in October 2014 (existing schemes to close by 2020), but expanded the CAIA BEPS tool as a replacement in 2011–2016, and famously told an Irish MEP who alerted him to the Single Malt BEPS tool, to "put on the green jersey". CAIA, can provide up to twice the tax shield of Single Malt, or Double Irish, and was identified with Apple in the 2015 leprechaun economics affair. US tax academics advocated the US switch to a "territorial" tax system in the December 2017 Tax Cuts and Jobs Act ("TCJA"), and as a result, forecast the demise of Irish BEPS tools, and Ireland as a US corporate tax haven. However, by mid–2018, other tax academics, including the IMF, noted technical flaws in the TCJA had increased the attractiveness of Ireland's BEPS tools, and the CAIA BEPS tool in particular, which post-TCJA, delivered a total effective tax rate ("ETR") of 0–2.5% on profits that can be fully repatriated to the US without incurring any additional US taxation. In July 2018, one of Ireland's leading tax economists forecasted a "boom" in the use of the Irish CAIA BEPS tool, as US multinationals close existing Double Irish BEPS schemes before the 2020 deadline. Under OECD rules, corporations with intellectual property ("IP"), which are mostly technology and life sciences firms, can turn this into an intangible asset ("IA") on their balance sheet, and charge it out as a tax-deductible royalty payment to end-customers. Without such IP, if Microsoft charged a German end-customer, say $100, for Microsoft Office, a profit of circa $95 (as the cost of Microsoft selling copies of Microsoft Office is small) would be realised in Germany, and German tax payable. With such IP, Microsoft can additionally charge Microsoft Germany $95 in IP royalty payments on each copy of Microsoft Office, ensuring that its German profits are zero. The $95 is paid to the location in which the IP is legally housed. Microsoft would prefer to house this IP in a tax haven, however, higher-tax locations like Germany do not sign full tax treaties with tax havens, and would not accept the IP charged from a tax haven as deductible against German taxation. The Double Irish fixes this problem. The Double Irish enables the IP to be charged-out from Ireland, which has a large global network of full bilateral tax treaties. [g] The Double Irish enables the hypothetical $95 which was sent from Germany to Ireland, to be sent-on to a tax haven like Bermuda, without incurring any Irish taxation. The techniques of using IP to relocate profits from higher-tax locations to low-tax locations are called base erosion and profit shifting ("BEPS") tools. There are many types of BEPS tools (e.g. Debt–based BEPS tools), however, IP-based BEPS tools are the largest group. The Double Irish is an IP–based BEPS tool. As with all Irish BEPS tools, the Irish subsidiary must conduct a "relevant trade" on the IP in Ireland. [h] A "business plan" must be produced with Irish employment and salary levels that are acceptable to the Irish State during the period the BEPS tool is in operation. [i] Despite these requirements, the effective tax rate ("ETR") of the Double Irish is almost 0%, as the EU Commission discovered with Apple in 2016. 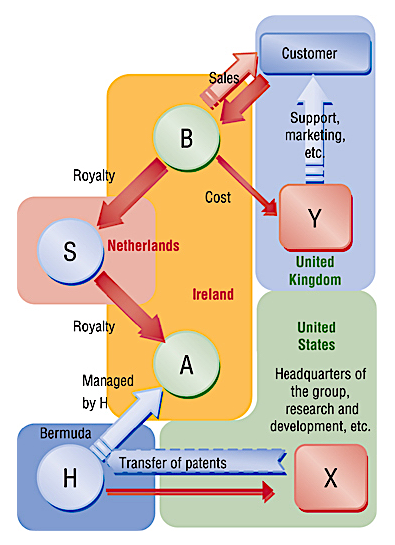 Most major U.S. technology and life sciences multinationals have been identified as using the Double Irish. By 2010, US$95 billion of U.S. profits were shifted annually to Ireland,, which increased to US$106 billion by 2015. As the BEPS tool with which U.S. multinationals built up untaxed offshore reserves of circa US$1 trillion from 2004 to 2017,[c][d] the Double Irish is the largest tax avoidance tool in history. In 2016, when the EU levied a €13 billion fine on Apple, the largest tax fine in history, it only covered the period 2004–14, during which Apple shielded €111 billion in profits from U.S (and Irish) tax. The earliest recorded versions of the Double Irish-type BEPS tools are by Apple in the late 1980s, and the EU discovered Irish Revenue tax rulings on the Double Irish for Apple in 1991. Irish State documents released to the Irish national archives in December 2018 showed that Fine Gael ministers in 1984 sought legal advice on how U.S. corporations could avoid taxes by operating from Ireland. The former Irish Taoiseach, John Bruton, wrote to the then Finance Minister, Alan Dukes saying: "In order to retain the maximum tax advantage, US corporations will wish to locate FSCs in a country where they will have to pay little or no tax. Therefore unless FSCs are given favourable tax treatment in Ireland, they will not locate here." Feargal O'Rourke, PwC tax partner in the IFSC (and son of Minister Mary O'Rourke, cousin of the 2008–2011 Irish Finance Minister Brian Lenihan Jnr) is regarded as its "grand architect". 1. CORP (X) creates the software. 2. CORP (X) sells IP to BER1 (H). 3. BER1 (H) revalues IP higher. 4. BER1 (H) licenses IP to IRL2 (A). 5. IRL2 (A) licenses IP to DUT1 (S). 6. DUT1 licenses IP to IRL1 (B). 7. IRL1 sells software to customer. A. Customer pays $100 to IRL1 (B). B. IRL1 pays $100 to DUT1 (S) as royalty. C. DUT1 pays $100 to IRL2 (A) as royalty. D. IRL2 pays $100 to BER1 (H) as royalty. E. BER1 accumulates the cash. F. BER1 can lend cash to CORP.
BER1 lends the $100 cash back to CORP (and other subsidiaries). This structure has a problem. The pre–TCJA U.S. tax code allows foreign income to be left in foreign subsidiaries (deferring U.S. taxes), but it will consider BER1 to be a controlled foreign corporation (or "CFC"), sheltering income from a related party transaction (i.e. IRL1). It will apply full U.S. taxes to BER1 at 35%. To get around this, the U.S. corporation needs to create a second Irish company (IRL2, or A), legally incorporated in Ireland (so under the U.S. tax code it is Irish), but which is "managed and controlled" from Bermuda (so under the Irish tax code it is from Bermuda). IRL2 will be placed between BER1 and IRL1 (i.e. owned by BER1, and owning IRL1). Up until the 2015 shut-down of the Double Irish, the Irish tax code was one of the few that allowed a company be legally incorporated in its jurisdiction, but not be subject to its taxes (if managed and controlled elsewhere). The U.S. corporation will "check-the-box" for IRL1 as it is clearly a foreign subsidiary selling to non–U.S. locations. The U.S. tax code will rightly ignore IRL1 from U.S. tax calculations. However, because the U.S. tax code also views IRL2 as foreign (i.e. Irish), it also ignores the transactions between IRL1 and IRL2 (even though they are related parties). This is the essence of the Double Irish arrangement. Note that in some explanations and diagrams BER1 is omitted (the Bermuda black hole), however, it is rare for a U.S. corporation to "own" IRL2 directly. The Irish tax code historically levied a 20% withholding tax on transfers from an Irish company like IRL1, to companies in tax havens like BER1. However, if IRL1 sends the money to a new Dutch company DUT1 (or S), via another royalty payment scheme, no Irish withholding tax is payable as Ireland does not levy withholding tax on transfers within EU states. In addition, under the Dutch tax code DUT1 can send money to IRL2 under another royalty scheme without incurring Dutch withholding tax, as the Dutch do not charge withholding tax on royalty payment schemes. This is called the dutch sandwich and DUT1 is described as the "dutch slice" (sitting between IRL1 and IRL2). Thus, with the addition of IRL2 and DUT1, we have the "Double Irish dutch sandwich" tax structure. In 2010, the Irish State, on lobbying from PwC Ireland's IFSC tax partner, Feargal O'Rourke, relaxed the rules for sending royalty payments to non–EU countries without incurring Irish withholding tax (thus ending the dutch sandwich), but they are subject to conditions that will not suit all Double Irish arrangements. O'Rourke set out to simplify those structures, eliminating the need for a Dutch intermediary. In October 2007, he met at Google's Dublin headquarters on Barrow Street with Tadhg O'Connell, the head of the Revenue division that audits tech companies. O'Connell is understood to have rejected O'Rourke's request that royalties like Google's should be able to flow directly to units in Bermuda and Cayman without being taxed. In 2008, O'Rourke's cousin Brian Lenihan became finance minister, setting much of the Revenue's policy. Two years later, after continued entreaties by O'Rourke, the Revenue's office announced that it would no longer impose withholding taxes on such transactions. James R. Hines Jr. is the most cited academic on tax haven research and his 1994 Hines–Rice paper, the most cited paper in all research into tax havens, was relied upon by the Council of Economic Advisors in October 2017 when advocating the corporate tax cuts proposed by the Tax Cuts and Jobs Act. The 2014–16 EU investigation into Apple in Ireland (see below), showed that the Double Irish existed as far back as 1991. Early U.S. academic research in 1994 into U.S. multinational use of tax havens identified profit shifting accounting techniques. U.S. congressional investigations into the tax practices of U.S. multinationals were aware of such BEPS tools for many years. However, the U.S. did not try to force the closure of the Double Irish BEPS tool, instead it was the EU which forced Ireland to close the Double Irish to new schemes in October 2014. Even still, existing users of the Double Irish BEPS tool (e.g. Apple, Google, Facebook, Microsoft, amongst many others), were given five more years until January 2020, before the tool would be fully shut-down to all users. This approach by successive U.S. administrations is explained by an early insight that one of the most cited U.S. academic researchers into tax havens, and corporate taxation, James R. Hines Jr., had in 1994. Hines realised in 1994, that: "low foreign tax rates [from tax havens] ultimately enhance U.S. tax collections". Hines would revisit this concept several times, as would others, and it would guide U.S. policy in this area for decades, including introducing the "check-the-box"[k] rules in 1996, curtailing the 2000–10 OECD initiative on tax havens, and not signing the 2016 OECD anti-BEPS initiative. Lower foreign tax rates entail smaller credits for foreign taxes and greater ultimate U.S. tax collections (Hines and Rice, 1994). Dyreng and Lindsey (2009), offer evidence that U.S. firms with foreign affiliates in certain tax havens pay lower foreign taxes and higher U.S. taxes than do otherwise-similar large U.S. companies. By September 2018, tax academics proved U.S. multinationals were the largest users of BEPS tools, and that Ireland was the largest global BEPS hub. In December 2018, Seamus Coffey, the Chairman of the Irish Fiscal Advisory Council, told The Times in relation to the closure of the Double Irish that "A lot of emphasis has been put on residency rules and I think that emphasis has been misplaced and the changes didn’t have that much [of an] effect". 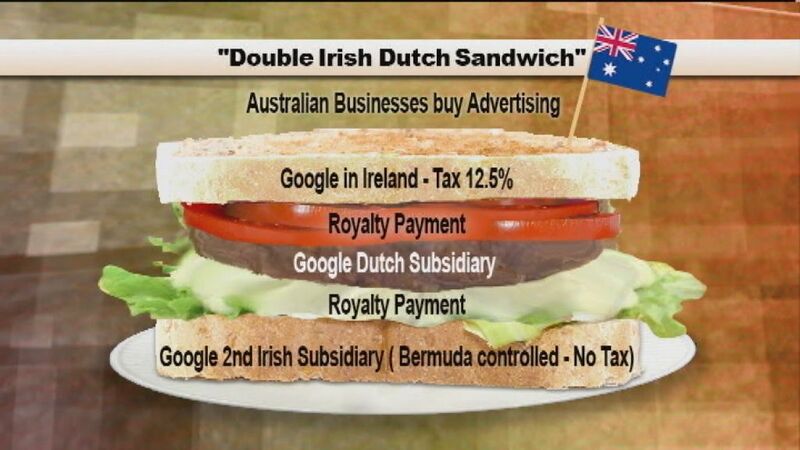 On 3 January 2019, The Guardian reported that Google avoided corporate taxes on US$23 billion of profits in 2017 by using the Double Irish with the Dutch sandwich extension. By 2016, Apple was Ireland's largest company, and post leprechaun economics, was over one quarter of Irish GDP. Apple's use of the Double Irish BEPS tool to achieve tax rates <1%, dates back to the late 1980s, and was investigated by the U.S. Senate in May 2013, and covered in the main financial media. On 29 August 2016 the European Commissioner for Competition concluded Apple had received illegal State aid from Ireland. The Commission ordered Apple to pay €13 billion, plus interest, in unpaid Irish taxes on circa €111 billion of profits, for the ten-year period, 2004–2014. It was the largest corporate tax fine in history. Apple was not using the standard Double Irish arrangement of two Irish companies (IRL1 in Ireland, and IRL2 in Bermuda). Instead, Apple combined the functions of the two companies inside one Irish company (namely, Apple Sales International, or ASI), which was split into two internal "branches". The Irish Revenue issued private rulings to Apple in 1991 and 2007 regarding this hybrid-double Irish structure, which the EU Commission considered as illegal State aid. This selective treatment allowed Apple to pay an effective corporate tax rate of 1 per cent on its European profits in 2003 down to 0.005 per cent in 2014. —  Margrethe Vestager, "State aid (SA.38373): Ireland gave illegal tax benefits to Apple worth up to €13 billion", 30 August 2016. In an October 2013 interview, the noted "grand architect" of the Double Irish BEPS tool, Irish International Financial Services Centre ("IFSC") PWC tax partner Feargal O'Rourke (see above), said that: "the days of the Double Irish tax scheme are numbered". In October 2014, as the EU forced the Irish State to close the Double Irish BEPS tool, the influential U.S. National Tax Journal published an article by Jeffrey L Rubinger and Summer Lepree, showing that Irish based subsidiaries of U.S. corporations could replace the Double Irish arrangement with a new structure (now known as Single Malt). If the Bermuda–controlled Irish company (IRL2) was relocated to a country with whom (a) Ireland had a tax treaty, (b) with wording on "management and control" tax residency, and (c) had a zero corporate tax rate, then the Double Irish effect could be replicated. They highlighted Malta as a candidate. The Irish media picked up the article, but when an Irish MEP notified the then Finance Minister, Michael Noonan, he was told to "Put on the green jersey". The Single Malt is also an IP–based BEPS tool, and as a small variation of the Double Irish, required little additional development, except choosing specific locations with the necessary specific wording in their Irish bilateral tax treaties (e.g. Malta and the UAE); thus the basic structure is almost identical to the Double Irish with often a Maltese company replaced as BER1 (from earlier). A November 2017 report by Christian Aid, titled Impossible Structures, showed how quickly the Single Malt BEPS tool was replacing the Double Irish. The report detailed Microsoft's (via LinkedIn), and Allergen's schemes and extracts from advisers to their clients. The report also showed that Ireland was behaving like a "Captured State", and for example had opted out of Article 12 of the 2016 OECD anti-BEPS initiative to protect the Single Malt BEPS tool (it was also later pointed out in September 2018, that Malta had similarly opted out of Article 4 of the initiative to enable it to be the recipient of the Single Malt). The then Irish Finance Minister Paschal Donohoe said that it would be investigated, however, questions were raised regarding the Irish State's policy of addressing corporate tax avoidance. Figures released in April 2017 show that since 2015 there has been a dramatic increase in companies using Ireland as a low-tax or no-tax jurisdiction for intellectual property (IP) and the income accruing to it, via a nearly 1000% increase in the uptake of a tax break expanded between 2014 and 2017. In September 2018, the Irish Times revealed that U.S. medical device manufacturer Teleflex, had created a new Single Malt scheme in July 2018, and had reduced their overall effective corporate tax rate to circa 3%. The same article quoted a spokesman from the Department of Finance (Ireland) saying they had not as yet taken any action regarding the Single Malt BEPS tool, but they were keeping the matter, "under consideration". In November 2018, the Irish Government amended the Ireland–Malta tax treaty to prevent the Single Malt BEPS tool being used between Ireland and Malta (it can still be used with the UAE for example); however, the exact closure date of the Irish Single Malt BEPS tool with Malta was deferred until September 2019. On the same day that the closure was announced, the Irish Times reported that LinkedIn (Ireland), identified as a user of the Single Malt tool in 2017 (see above), had announced in filings that it had sold a major IP asset to its parent, Microsoft (Ireland). Earlier in July 2018, Ireland's Sunday Business Post, disclosed that Microsoft (Ireland) were preparing a restructure of their Irish BEPS tools into a CAIA (or Green Jersey) Irish tax structure. The Double Irish and Single Malt BEPS tools enable Ireland to act as a confidential "Conduit OFC" rerouting untaxed profits to places like Bermuda (e.g. it must be confidential as higher-tax locations would not sign full tax treaties with locations like Bermuda), the Capital Allowances for Intangible Assets ("CAIA") BEPS tool (also called the Green Jersey), enables Ireland to act as the terminus for the untaxed profits (e.g. Ireland becomes Bermuda, a "Sink OFC"). The CAIA uses the accepted tax concept of providing capital allowances for the purchase of assets. [l] However, Ireland turns it into a BEPS tool by providing the allowances for the purchase of intangible assets, and especially intellectual property assets, and critically, where the owner of the intangible assets is a "connected party" (e.g. a Group subsidiary). A hypothetical multinational with an equity market capitalisation of €1,000 million, but tangible assets of €100 million, can argue that the gap of €900 million represents its intangible asset base, which can be legally created and appropriately located. [m] [..] Ireland's Capital Allowances for Intangible Assets program enables these intangible assets to be turned into tax deductible charges. [..] With appropriate structuring, the intergroup acquisition financing for the purchase of these intangible assets, can also be used to further amplify the quantum of tax deductible charges. I cannot see a justification for giving large amounts of Irish tax relief to the intragroup acquisition of a virtual group asset, except that it is for the purposes of facilitating corporate tax avoidance. In June 2009, the Irish State established the Commission on Taxation, to review Ireland's tax regime, and included Feargal O'Rourke, the "grand architect" of the Double Irish tool. In September 2009, the Commission recommended that the Irish State provide capital allowances for the acquisition of intangible assets, creating the CAIA BEPS tool. The 2009 Finance Act, materially expanded the range of intangible assets attracting Irish capital allowances deductible against Irish taxable profits. These "specified intangible assets" cover more esoteric intangibles such as types of general rights, general know-how, general goodwill, and the right to use software. It includes types of "internally developed" group intangible assets and intangible assets purchased from "conntected parties". The control is that the intangible assets must be acceptable under GAAP (older 2004 Irish GAAP is used), and auditable by an Irish IFSC accounting firm, like PwC or Ernst & Young. In the 2010 Finance Act, on the recommendation of the Department of Finance's Tax Strategy Group, the CAIA BEPS tool was upgraded, reducing the amortisation and "clawback" period from 15 to 10 years, and expanding the range of intangible assets to include "a broader definition of know-how". In the 2011 and 2012 Finance Acts, the Tax Strategy Group made additional amendments to the rules regarding the acquisition of intangible assets from "connected parties", and the "employment tax" users of the CAIA BEPS tool must pay. [h] The 2012 Finance Act removed the minimum amortisation period for the acquired intangible assets, and reduced the "clawback" to 5 years for CAIA schemes set up after February 2013. The first known user of the CAIA BEPS tool was by Accenture, the first U.S. corporate tax inversion to Ireland in 2009. By March 2017, Bloomberg would report that Ireland had become the most popular destination for U.S. corporate tax inversions in history, and would have the largest Medtronic (2015), 3rd-largest Johnson Controls (2016), 4th-largest Eaton Corporation (2012) and 6th-largest Perrigo (2013) U.S. corporate tax inversions in history. At the end of the 10 years, IRL1, repeats steps iv. to ix. above, and buys a new intangible asset from BER1 for $1 billion. While the loophole behind the Double Irish has been closed, CAIA is a more established tax concept internationally, although only for tangible assets. As with all Irish BEPS tools, the Irish subsidiary must conduct a "relevant trade" on the acquired IP. [h] A "business plan" must be produced with Irish employment and salary levels that are acceptable to the Irish State during the period capital allowances are claimed. [i] If the Irish subsidiary is wound up within 5 years,[p] the CAIA intangible capital allowances are repayable, which is called "clawback". Intellectual Property: The effective corporation tax rate can be reduced to as low as 2.5% for Irish companies whose trade involves the exploitation of intellectual property. The Irish IP regime is broad and applies to all types of IP. A generous scheme of capital allowances .... in Ireland offer significant incentives to companies who locate their activities in Ireland. A well-known global company [Accenture in 2009] recently moved the ownership and exploitation of an IP portfolio worth approximately $7 billion to Ireland. The tax deduction can be used to achieve an effective tax rate of 2.5% on profits from the exploitation of the IP purchased [via the CAIA scheme]. Provided the IP is held for five years, a subsequent disposal of the IP will not result in a clawback. Structure 1: The profits of the Irish company will typically be subject to the corporation tax rate of 12.5% if the company has the requisite level of substance to be considered trading. The tax depreciation and interest expense can reduce the effective rate of tax to a minimum of 2.5%. The EU Commission's 30 August 2016 findings against Apple's hybrid–Double Irish BEPS tool, Apple Sales International ("ASI"), covered the period from 2004 to end 2014 (see above). The EU's August 2016 report on Apple, notes that Apple had informed the Commission at the start of 2015 that they had closed their hybrid–Double Irish BEPS tool. In January 2018, Irish economist Seamus Coffey, Chairman of the State's Irish Fiscal Advisory Council, and author of the State's 2017 Review of Ireland's Corporation Tax Code, showed Apple restructured ASI into the CAIA BEPS tool in Q1 2015. During Q1 2018, Coffey, and international economists, proved Ireland's 2015 "leprechaun economics" GDP growth of 33.4%, was almost solely attributable to Apple's new CAIA BEPS tool. Coffey noted the significance of Apple's endorsement of the CAIA BEPS tool, given Apple's status as one of the longest users of the Double Irish BEPS tool, and one of the largest users of BEPS tools worldwide. In January 2018, there was further controversy over Apple's CAIA BEPS tool when Coffey pointed out that it is prohibited under Ireland's tax code (Section 291A(c) of the Taxes and Consolation Act 1997), to use the CAIA BEPS tool for reasons that are not "commercial bona fide reasons", and in schemes where the main purpose is "... the avoidance of, or reduction in, liability to tax". In addition, it was realised in hindsight, that changes former Finance Minister Michael Noonan made in the Irish 2015 Finance Budget, was to ensure the ETR of Apple's CAIA tool was reduced to zero. In June 2018, Apple's post Q1 2015 BEPS tax structure in Ireland was labelled "the Green Jersey" by the EU Parliament's GUE–NGL body and described in detail. In December 2017, the Irish Government accepted the recommendation of Coffey that the corporation tax relief for the Irish CAIA BEPS tool be capped at 80% for new arrangements, to restore the CAIA's effective Irish corporate tax rate ("ETR") back to 2.5%. [o] This was enacted in the 2017 Finance Budget, but only for new CAIA BEPS schemes (e.g. Apple's 2015 CAIA scheme would not be affected). Given the dramatic take-up in the CAIA tool in 2015, when the cap lifted (e.g. the ETR was 0%), Irish commentators challenged Coffey's recommendation. He responded in a paper in late 2017. In 2015 there were a number of “balance-sheet relocations” with companies who had acquired IP while resident outside the country becoming Irish-resident. It is possible that companies holding IP for which capital allowances are currently being claimed could become non-resident and remove themselves from the charge to tax in Ireland. If they leave in this fashion there will be no transaction that triggers an exit tax liability. In July 2018, it was reported that Microsoft was preparing to execute another "Green Jersey" CAIA BEPS transaction. which, due to technical issues with the TCJA, makes the CAIA BEPS tool attractive to U.S. multinationals. In July 2018, Coffey posted that Ireland could see a "boom" in the onshoring of U.S. IP, via the CAIA BEPS tool, between now and 2020, when the Double Irish is fully closed. OECD public debt per-capita table for 2015. An "artificially inflated GDP-per-capita statistic", is a feature of tax havens, due to the BEPS flows. In February 2017, Ireland's national accounts became so distorted by BEPS flows that the Central Bank of Ireland replaced Irish GDP and Irish GNP with a new economic measure, Irish Modified GNI*. However, in December 2017, Eurostat reported that Modified GNI* did not remove all of the distortions from Irish economic date. By September 2018, the Irish Central Statistics Office ("CSO") reported that Irish GDP was 162% of Irish GNI* (e.g. BEPS tools artificially inflated Ireland's GDP by 62%). In contrast EU–28 2017 GDP was 100% of GNI. Irish public indebtedness changes dramatically depending on whether Debt-to-GDP, Debt-to-GNI* or Debt-per-Capita is used (Per-Capita removes all BEPS tool distortion). Main article: Ireland as a tax haven § Global "knowledge hub" for "selling into Europe"
Tax academics show multinationals from countries with "territorial" tax systems make little use of tax havens like Ireland. Since the UK changed its tax regime to a "territorial" system in 2009–12, Ireland has failed to attract corporates from any other jurisdiction except the US, one of the last "worldwide" tax systems. [e][f] By September 2018, US–controlled corporates were 25 of Ireland's 50 largest companies, paid 80% of Irish business taxes, and directly employed 25% of the Irish labour force, and created 57% of Irish value-add. The past President of the Irish Tax Institute stated they pay 50% of all Irish salary taxes (due to higher paying jobs), 50% of all Irish VAT, and 92% of all Irish customs and excise duties. The American-Ireland Chamber of Commerce estimated the value of US investment in Ireland in 2018 was €334 billion, exceeding Irish GDP (€291 billion in 2016), and exceeding the combined investment of US investment in the BRIC countries. The US multinational subsidiaries in Ireland, are not simply used for booking EU sales, in most cases, they handle the entire non–US business of the Group. [a] Apart from US corporates, and legacy UK corporates (pre 2009–12), there are no foreign corporates in Ireland's top 50 firms. Academics say Ireland is more accurately described as a "US corporate tax haven", and a shield for non–US profits from the historic US "worldwide" tax system. One of the most contested aspects of Ireland's economy is the aggregate "effective tax rate" (ETR) of Ireland's corporate tax regime. The Irish State refutes tax haven labels as unfair criticism of its low, but legitimate, 12.5% Irish corporate tax rate, which it defends as being the effective tax rate ("ETR"). Independent studies show that Ireland's aggregate effective corporate tax rate is between 2.2% to 4.5% (depending on assumptions made). This lower aggregate effective tax rate is consistent with the individual effective tax rates of US multinationals in Ireland, as well as the IP-based BEPS tools openly marketed by the main Irish tax-law firms, in the IFSC, with ETRs of 0–2.5% (see "effective tax rate"). Dominance of US companies: Irish corporate Gross Operating Surplus (i.e. profits), by the controlling country of the company (note: a material part of the Irish figure is also from US tax inversions who are US–controlled). Eurostat (2015). In June 2018, tax academics showed that Ireland had become the world's largest global BEPS hub, or corporate-focused tax haven. In September 2018, tax academics showed that US multinationals were the largest users of BEPS tools. In 2016, leading tax academic James R. Hines Jr., showed that multinationals from "territorial" tax systems, the system used by almost all global economies bar a handful but which included the US,[e] make little use of tax havens. Hines, and others, had previously quoted the example of the U.K., who transitioned from a "worldwide" system to a "territorial" system in 2009-2012, which led to a reversal of many UK inversions to Ireland, and turned the U.K. into one of the leading destinations for U.S. corporate tax inversions (although Ireland is still the most popular). A similar case study was cited in the switch by Japan in 2009 from a full US "worldwide" tax system (e.g. very high domestic tax rate, partially mitigated by a controlled foreign corporation regime), to a full "territorial" tax system, with positive results. In December 2017, the U.S. Tax Cuts and Jobs Act ("TCJA"), the U.S. changed from a "worldwide" tax system to a hybrid–"territorial" tax system,[r] to encourage U.S. multinationals to relocate functions back from tax havens. [e] In addition, the US, as the UK had done in 2009–12, aimed to become a favoured destination for foreign multinational to relocate. In their October 2017 report on the proposed TCJA legalisation, the U.S. Council of Economic Advisors, quoted Hines' work on tax havens, and used Hines' calculations, to estimate the quantum of U.S. investment that should return as a result of the TCJA. As a "carrot", the TCJA enables these firms to charge out their IP globally (just like with a Double Irish or Single Malt arrangement) but from a U.S. base, at a preferential FDII tax rate of 13.125% . In addition, the extra reliefs of 100% capital expensing, and 21% relief on U.S. costs, make the effective FDII rate 1–2% lower again (or 11–12%). As a "stick", the TCJA GILTI tax rate forces these firms to pay a minimum U.S. tax rate of 10.5% on their global IP, regardless of where their IP is located. In addition, only getting 80% relief (not 100%), against foreign taxes paid, means that the effective GILTI rate is 1–2% higher again (or 11–12%, similar to the net FDII rate). In March–April 2018, major U.S. tax law firms showed that pre the TCJA, U.S. multinationals with the IP needed to use Irish BEPS tools, would achieve effective Irish tax rates ("ETR") of 0–2.5%[s] versus 35% under the historical U.S. system. However, post the TCJA, these multinationals can use their IP to achieve U.S. ETRs, which net of the TCJA's 100% capital relief provisions, are similar to the ETRs they would achieve in Ireland when the TCJA's new GILTI provisions are taken into account (e.g. ETR of circa 11–12%). In Q1 2018, U.S. multinationals like Pfizer announced in Q1 2018, a post-TCJA global tax rate for 2019 of circa 17%, which is close to the circa 15–16% 2019 tax rate announced by past U.S. corporate tax inversions to Ireland, Eaton, Allergan, and Medtronic. As the TCJA was being passed in December 2017, the new corporate tax provisions were recognised by the Irish media, as a challenge. Donald Trump had "singled out" Ireland in 2017 speeches promoting the TCJA, and Trump administration economic advisor, Stephen Moore, predicted "a flood of companies" would leave Ireland due to the TCJA. Leading U.S. tax academic, Mihir A. Desai[t] in a post–TCJA 26 December 2017 interview in the Harvard Business Review said that: "So, if you think about a lot of technology companies that are housed in Ireland and have massive operations there, they’re not going to maybe need those in the same way, and those can be relocated back to the U.S. In December 2017, U.S technology firm Vantiv, the world's largest payment processing company, confirmed that it had abandoned its plan to execute a corporate tax inversion to Ireland. In March 2018, the Head of Life Sciences in Goldman Sachs, Jami Rubin, stated that: "Now that [U.S.] corporate tax reform has passed, the advantages of being an inverted company are less obvious". In August 2018, U.S. multinational Afilias, who had been headquartered in Ireland since 2001, announced that as a result of the TCJA, it was moving back to the U.S. However, in contrast, it was reported in May–July 2018, that U.S. tax academics and tax economists were discovering material technical flaws in the TCJA that incentivise the U.S. use of tax havens like Ireland. Of particular note was the exclusion from the GILTI tax of the first 10% of profits on overseas tangible assets, which incentivises investment in tangible assets abroad. However, a more serious concern, was the acceptance of capital allowances, both tangible and intangible, as deductible against GILTI taxation, which would enable U.S. users of the CAIA BEPS tool to convert their Irish ETR of 0–2.5%, into a final U.S. ETR of 0–2.5%. In May–July 2018, Google and Facebook announced large expansions of their Dublin office campuses in Ireland. A June 2018 IMF country report on Ireland, while noting the significant exposure of Ireland's economy to U.S. corporates, concluded that the TCJA may not be as effective as Washington expects in addressing Ireland as a U.S. corporate tax haven. In writing its report, the IMF conducted confidential anonymous interviews with Irish corporate tax experts. In July 2018, it was reported that Microsoft was preparing to execute Apple's "Green Jersey" CAIA BEPS transaction. In July 2018, Seamus Coffey, Chairperson of the Irish Fiscal Advisory Council and author of the Irish State's 2016 review of the Irish corporate tax code, posted that Ireland could see a "boom" in the onshoring of U.S. IP, via the CAIA BEPS tool, between now and 2020, when the Double Irish is fully closed. In February 2019, Brad Setser from the Council on Foreign Relations, wrote a New York Times article highlighting material issues with TCJA in terms of combatting tax havens. This is not a comprehensive list as many US multinationals in Ireland use "unlimited liability companies" (ULCs), which do not file public accounts with the Irish CRO. ^ a b The Double Irish is sometimes misunderstood as being only used for EU–sourced revenues and business. For example, in 2016, Facebook recorded global revenues of $27 billion, while Facebook in Ireland paid €30 million in Irish tax on Irish revenues of €13 billion (approximately half of all global revenues). Similarly, when the EU introduced the GDPR regulations in 2018, Facebook disclosed that all of its non–U.S. accounts (circa 1.9 billion, of which 1.5 billion were non-E.U), were legally based in Dublin. Similarly, Google is also believed to run most of its non–U.S. sales revenue and profits through its Dublin operation. ^ Before the US 2017 TCJA repatriation tax, the Double Irish shielded all non–US profits of US multinationals from: (a) taxation in the end-consumer market, (b) from taxation in Ireland, and (c) from US taxation. The 2017 TCJA placed a 15.5% US tax on these untaxed profits, and they were deemed to be automatically repatriated (regardless of whether the US multinational wanted to repatriate the untaxed profits or not). ^ a b 2004 was the date of the last Bush Administration tax amnesty, when pre–2004 offshore untaxed cash was repatriated at a special U.S. tax rate of 5%; in 2018, the TCJA repatriation tax rate was 15.5%. ^ a b While various sources quote the amount of untaxed cash reserves as being closer to USD 2 trillion, a component of this figure represents cash flow that is awaiting reinvestment in the overseas markets, non-cash assets, and U.S. banking flows; the strong consensus is that the pure cash figure is at least over USD 1 trillion. ^ a b c d Before the passing of the TCJA in December 2017, the US was one of eight remaining jurisdictions to run a "worldwide" taxation system, which was the principal obstacle to US corporate tax reform, as it was not possible to differentiate between the source of income. The seven other "worldwide" tax systems, are: Chile, Greece, Ireland, Israel, Korea, Mexico, and Poland. The positive experience of the UK switch to a "territorial" system in 2009-12, and the Japanese switch to a "territorial" system in 2009, amongst others, was continually highlighted by US tax academics. ^ a b c It is believed that Ireland's extreme economic exposure to US corporate BEPS activity, had led Ireland to expand into more traditional tax haven–type tools, such as the Qualifying investor alternative investment fund (QIAIF) (designed to compete with the Cayman Islands SPC), and the Irish Section 110 Special Purpose Vehicle (SPV) (designed to compete with the Luxembourg SPV). ^ a b In September 2018, Ireland had a global network of 73 bilateral tax treaties, and a 74th with Ghana awaiting ratification. ^ a b c Under Section 291A of the 1997 Irish Tax and Consolidated Acts, users of Irish BEPS tools must conduct a "relevant trade" and perform "relevant activities" in Ireland to give the BEPS tool a degree of credibility and substance. In effect, it can equate to an "employment tax" on the Irish subsidiary, however, to the extent that the "relevant activities" are needed within the Group (e.g. they are performing real tasks), then the effect of this "employment tax" is mitigated. While the Irish State has never published the employment metrics for using Irish BEPS tools, the evidence is that even where the "relevant activities" were completely unnecessary, the "employment tax" equates to circa 2–3% of profits shifted through Ireland (see here). ^ a b In documents released under FOI from the Irish Department of Finance Tax Strategy Group, they describe the CAIA BEPS tool as a: "measure was introduced to support the development of the knowledge economy and the provision of high-quality employment. ^ The most cited academic explanation of the Double Irish Dutch Sandwich, is Edward Kleinbard's 2011 Stateless Income, however it is not possible to reference a copy online. ^ Most tax codes in developed countries have capital allowance programs that give tax relief on capital expenditure that is amortised over the life of the capital asset on which the capital was invested in. ^ a b c d When the Irish State applied a cap of 80% on the total amount of Irish intangible capital allowances that can be used against taxable profits in any year, it gave an Irish effective tax rate ("ETR") of 2.5%, being the Irish corporation tax rate of 12.5% multiplied by 20%. Therefore, the ETR of the CAIA is often described as being 0-2.5%, depending on the Irish State rules regarding caps. During Apple's creation of an Irish CAIA BEPS tool in 2015, the CAIA cap was temporarily lifted to 100% (e.g. the ETR was 0%). ^ a b The TCJA's GILTI tax regime, which acts like an international alternative minimum tax for IP–heavy U.S. multinationals, has led some to qualify the new U.S. TCJA system as a hybrid–"territorial" system. ^ Desai had written several major academic papers on tax havens with James R. Hines Jr., including the second most cited academic paper on tax havens, The demand for tax haven operations (2006). ^ Adrian Weckler (29 November 2017). "Facebook paid just €30m tax in Ireland despite earning €12bn". Irish Independent. ^ David Ingram (18 April 2018). "Exclusive: Facebook to put 1.5 billion users out of reach of new EU privacy law". Reuters. ^ Simon Bowers (4 November 2016). "Google pays €47m in tax in Ireland on €22bn sales revenue". The Guardian. ^ "Google booked 41% of global revenues in Ireland in 2012; A leprechaun's gold?". Finfacts.ie. 30 September 2013. ^ a b "Dáil Éireann debate - Thursday, 23 Nov 2017". House of the Oireachtas. 23 November 2017. Pearse Doherty: It was interesting that when [MEP] Matt Carthy put that to the Minister's predecessor (Michael Noonan), his response was that this was very unpatriotic and he should wear the green jersey. That was the former Minister's response to the fact there is a major loophole, whether intentional or unintentional, in our tax code that has allowed large companies to continue to use the Double Irish [called Single Malt]. ^ Authur Beesley (31 January 2018). "Ireland enjoys tax boom but fears a reckoning: Dublin concerned about reliance on revenue from small group of multinational companies". Financial Times. ^ a b c d e Dhammika Dharmapala (2014). "What Do We Know About Base Erosion and Profit Shifting? A Review of the Empirical Literature". University of Chicago. p. 1. It focuses particularly on the dominant approach within the economics literature on income shifting, which dates back to Hines and Rice (1994) and which we refer to as the “Hines–Rice” approach. ^ Clemens Fuest; Christoph Spengel; Katharina Finke; Jost Heckemeyer; Hannah Nusser (15 October 2013). "Profit Shifting and "Aggressive" Tax Planning by Multinational Firms" (PDF). Centre for European Economic Research, (ZEW). ^ "Intellectual Property Tax Planning in the light of Base Erosion and Profit Shifting". University of Tilburg. June 2017. ^ "Revenue: Double Taxation Treaties". Revenue Commissioners. 3 September 2018. ^ a b c d "European Commission - PRESS RELEASES - Press release - State aid: Ireland gave illegal tax benefits to Apple worth up to €13 billion". europa.eu. EU Commission. 30 August 2016. Retrieved 14 November 2016. This selective treatment allowed Apple to pay an effective corporate tax rate of 1 per cent on its European profits in 2003 down to 0.005 per cent in 2014. ^ Jesse Drucker (23 October 2013). "Ireland: Where Profits Pile Up, Helping Multinationals Keep Taxes Low". Bloomberg. ^ a b Rónán Duffy (29 December 2018). "Fine Gael ministers discussed US corporations paying 'little or no tax' here in the 1980s". TheJournal.ie. ^ Fiona Reddan (8 May 2015). "Scion of a prominent political dynasty who gave his vote to accountancy". Irish Times. ^ a b c Jesse Drucker (3 November 2013). "Controversial tax strategies brainchild of O'Rourke's son". Irish Independent. ^ "Feargal O'Rourke Turning Ireland Into 'A Global Tax-Avoidance Hub'". Broadsheet Ireland. 29 October 2013. ^ Edward Kleinbard. "Stateless Income". Florida Tax Review. 11 (9): 699–744. ^ Vanessa Houlder (9 October 2014). "What is the Double Irish". The Financial Times. ^ a b c d Rodger Royse (1 November 2013). "Double Irish Tax Sandwich". Rose Law. ^ a b c Anthony Ting (October 2014). "Ireland's move to close the 'Double Irish' tax loophole unlikely to bother Apple, Google". The Guardian and University of Sydney. ^ "Taxation Guide to Investing in Ireland" (PDF). A&L Goodbody. June 2016. ^ "'Dutch Sandwich' saves Google and many other U.S. companies billions in taxes". MSNBC. 22 October 2010. ^ a b c "'Double Irish' and 'Dutch Sandwich' saved Google $3.7bn in tax in 2016". Irish Times. 2 January 2018. ^ "Treatment of Certain Patent Royalties Paid to Companies Resident Outside the State (e-brief 55/10)". Irish Revenue. June 2010. ^ "Ireland Expands Withholding Tax Exemption On Royalties". Mason Hayes Curran Law Firm. August 2010. ^ "Withhold No More - Outbound Patent Royalties Can Be Paid Gross". Matheson (law firm). June 2011. ^ a b "TAX CUTS AND JOBS ACT OF 2017 Corporate Tax Reform and Wages: Theory and Evidence" (PDF). Council of Economic Advisors. 17 October 2017. [In the Whitehouse advocating for the TCJA] Applying Hines and Rice’s (1994) findings to a statutory corporate rate reduction of 15 percentage points (from 35 to 20 percent) suggests that reduced profit shifting would result in more than $140 billion of repatriated profit based on 2016 numbers. ^ a b Alex Barker; Vincent Boland; Vanessa Houlder (October 2014). "Brussels in crackdown on 'Double Irish' tax loophole". The Financial Times. Brussels is challenging the “Double Irish” tax avoidance measure prized by big U.S. tech and pharma groups, putting pressure on Dublin to close it down or face a full-blown investigation. [..] The initial enquiries have signalled that Brussels wants Dublin to call time on the tax gambit, which has helped Ireland become a hub for American tech and pharma giants operating in Europe. ^ a b "Two years after the 'double Irish' was shelved, Google used it to shift billions to Bermuda". TheJournal.ie. 28 November 2018. TWO YEARS AFTER the controversial ‘double Irish’ loophole was closed to new entrants, Google continued using the system to funnel billions in untaxed profits to Bermuda. ^ a b Scott Dyreng; Bradley P. Lindsey (12 October 2009). "Using Financial Accounting Data to Examine the Effect of Foreign Operations Located in Tax Havens and Other Countries on U.S. Multinational Firms' Tax Rates". Journal of Accounting Research. 47 (5): 1283–1316. doi:10.1111/j.1475-679X.2009.00346.x. Finally, we find that U.S. firms with operations in some tax haven countries have higher federal tax rates on foreign income than other firms. This result suggests that in some cases, tax haven operations may increase U.S. tax collections at the expense of foreign country tax collections. ^ James K. Jackson (11 March 2010). "The OECD Initiative on Tax Havens" (PDF). Congressional Research Service. p. 7. As a result of the Bush Administration’s efforts, the OECD backed away from its efforts to target “harmful tax practices” and shifted the scope of its efforts to improving exchanges of tax information between member countries. ^ "International Tax Advisory: Impact of the Multilateral Instrument on U.S. Taxpayers: Why Didn't the United States Choose to Sign the MLI?". Alston & Bird. 14 July 2014. ^ Paul O'Donoghue (31 December 2018). "Double Irish move 'was not enough to tax close loophole'". The Times. ^ "Google shifted $23bn to tax haven Bermuda in 2017, filing shows". The Guardian. 3 January 2019. ^ "Quarter of Irish economic growth due to Apple's iPhone, says IMF". RTE News. 17 April 2018. ^ "iPhone exports accounted for quarter of Irish economic growth in 2017 - IMF". Irish Times. 17 April 2018. ^ a b "Senate Probe Finds Apple Used Unusual Tax Structure to Avoid Taxes". Reuters. Retrieved 20 May 2013. ^ a b c Jesse Drucker; Simon Bowers (6 November 2017). "After a Tax Crackdown, Apple Found a New Shelter for Its Profits". New York Times. ^ Cliff Taylor. "Apple's Irish company structure key to EU tax finding". Irish Times. Retrieved 2 September 2016. ^ Rita Barrera; Jessica Bustamante (2 August 2017). "The Rotten Apple: Tax Avoidance in Ireland". The International Trade Journal. 32: 150–161. doi:10.1080/08853908.2017.1356250. ^ a b Colm Kelpie (30 October 2013). "Days of 'Double Irish' tax scheme are numbered, says PwC's O'Rourke". The Irish Times. However, Mr O'Rourke, who is also a cousin of the late Finance Minister Brian Lenihan, told Bloomberg that changes in Ireland and across the globe on tax was inevitable. Mr O'Rourke was also a member of the Government's Commission on Taxation, which sat in 2008 and 2009. ^ a b JEFFREY L. RUBINGER; SUMMER AYERS LEPREE (23 October 2014). "Death of the "Double Irish Dutch Sandwich"? Not so Fast". Taxes Without Borders. ^ Sarah McCabe (9 November 2014). "Multinationals replacing 'Double Irish' with new tax avoidance scheme". Irish Independent. Another sophisticated loophole in the tax system means the removal of the "Double Irish" tax-avoidance strategy won't actually have any real impact for U.S. firms in Ireland seeking to lower their tax bills. An influential U.S. tax journal has found that the Irish subsidiaries of U.S. companies can easily opt to use another loophole, known as the "check the box" rule, to enjoy the same tax benefits created by the Double Irish. ^ a b c d e Peter Hamilton (26 September 2018). "Ireland's 'Single Malt' still aiding tax avoidance". The Irish Times. Prior to opening a Single Malt structure, Teleflex operated a Double Irish tax structure, according to Christian Aid. “Since Teleflex set up its Double Irish structure, through this and [presumably] other tax strategies its global effective tax rate has dropped to just over 3 per cent,” the NGO flagged. ^ a b c d e Mike Lewis (November 2017). "'Impossible' structures: tax outcomes overlooked by the 2015 tax Spillover analysis" (PDF). Christian Aid. ^ "Multinationals replacing 'Double Irish' with new tax avoidance scheme". RTE News. 14 November 2017. ^ "How often is the 'Single Malt' tax loophole used? The government is finding out". TheJournal.ie. 15 November 2017. ^ Jack Power (10 November 2017). "Ireland resists closing corporation tax 'loophole'". The Irish Times. Global legal firm Baker McKenzie representing a coalition of 24 multinational U.S. software firms, including Microsoft, lobbied Michael Noonan, as [Irish] minister for finance, to resist the [OECD MLI] proposals in January 2017. In a letter to him, the group recommended Ireland not adopt article 12, as the changes “will have effects lasting decades” and could “hamper global investment and growth due to uncertainty around taxation”. The letter said that “keeping the current standard will make Ireland a more attractive location for a regional headquarters by reducing the level of uncertainty in the tax relationship with Ireland’s trading partners”. ^ Suzanne Lynch (14 November 2017). "Paschal Donohoe says Government will examine 'Single Malt' loophole". The Irish Times. ^ Cantillion (16 November 2017). "Three years of silence on 'Single Malt' tax loophole raises questions". Irish Times. ^ Barry O'Halloran (28 November 2018). "Revenue to close 'single malt' tax loophole". Irish Times. Using a structure dubbed the “single malt”, some US multinationals have been using Irish-registered, Malta-resident, companies to cut tax liabilities in countries where they sell their goods and services. Minister for Finance Paschal Donohoe confirmed on Tuesday that a new agreement between Revenue and the Maltese tax authorities will close the loophole. ^ Paul O'Donoghue (28 November 2018). "Corporate tax loophole closure 'won't stop firms'". The Times. The new agreement will not come into force until near the end of September 2019 but a Department of Finance spokesman said that this would effectively shut off the loophole immediately because companies needed a lead-in time of about a year to use it. ^ Charlie Taylor (28 November 2018). "LinkedIn's Irish subsidiary pays $127m on $2.67bn profit". Irish Times. The Irish arm of LinkedIn reported a 20 per cent rise in revenues last year and returned to the black, helped by the disposal of intellectual property assets to its parent Microsoft Ireland. ^ a b c Ian Guider (24 June 2018). "Irish Microsoft firm worth $100bn ahead of merger". The Sunday Business Post. ^ "Intellectual Property Tax". KPMG. 4 December 2017. ^ a b Martin Brehm Christensen; Emma Clancy (21 June 2018). "Apple's Irish Tax Deals". European United Left–Nordic Green Left EU Parliament. ^ a b c d e f g "Ireland as a Location for Your Intellectual Property Trading Company" (PDF). Arthur Cox Law. April 2015. ^ a b Adjunct Professor Jim Stewart (2016). "MNE Tax Strategies in Ireland" (PDF). Trinity College Dublin. ^ "Commission on Taxation report 2009". UCD Archives. September 2009. ^ "Commission on Taxation Report Ireland 2009: Proposed property tax, a carbon tax, and domestic water charges as part of overhaul of Irish tax system". FinFacts. 7 September 2009. ^ "Corporate Taxation in Ireland 2016" (PDF). Industrial Development Authority (IDA). 2018. ^ a b c "Intangible Assets Scheme under Section 291A Taxes Consolidation Act 1997" (PDF). Irish Revenue. 2010. ^ a b c "Capital Allowances for Intangible Assets under section 291A of the Taxes Consolidation Act 1997 (Part 9 / Chapter 2)" (PDF). Irish Revenue. February 2018. ^ "Capital Allowances for Intangible Assets "Specified Assets"". Irish Revenue. September 2017. ^ "Ireland's Tax Regime for Investing in Intellectual Property" (PDF). FGS Partnership. June 2011. ^ "Ireland's Intellectual Property Regime". BDO Ireland. October 2016. ^ "Base Erosion and Profit Shifting (BEPS) tax diagnostic toolkit". PriceWaterhouseCoopers. 2016. ^ a b "Department of Finance Tax Strategy Group: Irish Corporate Taxation" (PDF). 10 June 2011. p. 5. (23-26) Tax relief for acquisition of intangible assets: A number of amendments to the scheme were made in Finance Act 2010 on foot, among other reasons, of the recommendations of the Innovation Taskforce Report. (1) The period in which a specified intangible asset must be used in the trade to avoid a clawback of allowances was reduced from 15 years to 10 years. (2) The list of specified intangible assets covered by the scheme was augmented by the inclusion of applications for the grant or registration of patents, copyright etc. and a broader definition of “know-how”. (3) Relief will now be available for capital expenditure incurred prior to the commencement of a trade on the provision of specified intangible assets for the purposes of the trade. ^ a b c John Ryan; Alan Connell (March 2013). "Ireland as a European gateway jurisdiction for China – outbound and inbound investments" (PDF). Matheson (law firm). The tax deduction can be used to achieve an effective tax rate of 2.5% on profits from the exploitation of the IP purchased. Provided the IP is held for five years, a subsequent disposal of the IP will not result in a clawback. ^ "Irish Revenue Note for Guidance on Intangible Assets". Chartered Accountants of Ireland. 2016. ^ Emily Stewart (22 July 2017). "As Treasury Moves to Bring Back Inversions, Here are 7 of the Biggest Recent Deals". TheStreet. ^ a b c Cliff Taylor (8 November 2017). "Change in tax treatment of intellectual property and subsequent and reversal hard to fathom". Irish Times. ^ "Capital allowances for intangible assets". Irish Revenue. 15 September 2017. ^ "'Big Seven' Irish law firms earned €720m last year". Irish Independent. 18 October 2017. ^ "Chairman, Fiscal Advisory Council: 'There's been a very strong recovery - we are now living within our means'". Irish Independent. 18 January 2018. ^ "Minister Donohoe publishes Review of Ireland's Corporation Tax Code". Department of Finance. 21 September 2017. ^ "REVIEW OF IRELAND'S CORPORATION TAX CODE, PRESENTED TO THE MINISTER FOR FINANCE AND PUBLIC EXPENDITURE AND REFORM BY MR. SEAMUS COFFEY" (PDF). Department of Finance. 30 January 2017. ^ a b Seamus Coffey Irish Fiscal Advisory Council (24 January 2018). "What Apple did next". Economic Perspectives, University College Cork. ^ a b Brad Setser (25 April 2018). "Tax Avoidance and the Irish Balance of Payments". Council on Foreign Relations. ^ a b Brad Setser (30 October 2017). "Apple's Exports Aren't Missing: They Are in Ireland". Council on Foreign Relations. ^ Naomi Fowler (25 June 2018). "New Report on Apple's New Irish Tax Structure". Tax Justice Network. ^ "Tax break for IP transfers is cut to 80pc". Department of Finance. 11 October 2017. ^ "Revenue eBrief No. 016/18 Capital allowances for specified intangible assets". Irish Revenue. 2 February 2018. ^ a b "Intangibles, taxation and Ireland's contribution to the EU Budget". Seamus Coffey. 19 December 2017. ^ "IRISH ECONOMY: Intangibles, taxation and Ireland's contribution to the EU Budget". irisheconomy.ie. 19 October 2017. ^ a b Seamus Coffey, Irish Fiscal Advisory Council (18 July 2018). "When can we expect the next wave of IP onshoring?". Economics Incentives, University College Cork. IP onshoring is something we should be expecting to see much more of as we move towards the end of the decade. Buckle up! ^ OECD Ireland Survey 2018 (PDF). OECD. March 2018. p. 34. ISBN 978-92-64-29177-5. ^ a b Heike Joebges (January 2017). "CRISIS RECOVERY IN A COUNTRY WITH A HIGH PRESENCE OF FOREIGN-OWNED COMPANIES: The Case of Ireland" (PDF). IMK Macroeconomic Policy Institute, Hans-Böckler-Stiftung. ^ "Ireland's deglobalised data to calculate a smaller economy". Financial Times. 17 July 2017. ^ "Real GDP per capita". Eurostat. Retrieved 26 November 2018. ^ "Who owes more money - the Irish or the Greeks?". Irish Times. 4 June 2015. ^ "Why do the Irish still owe more than the Greeks?". Irish Times. 7 March 2017. Why, then, when we look at debt on a per-capita basis, is it still so high? Per person, the Irish are right up the top of the leaderboard, with government debt per person of $45,941 (€43,230) as of March 1st, behind only Japan ($80,465) and the US ($48,203). ^ Fiona Reddan (12 September 2018). "Who still owes more, Ireland or the Greeks". Irish Times. ^ "CORPORATE INVERSIONS: A POLICY PRIMER". Wharton University. 24 October 2016. Retrieved 21 April 2019. ^ a b James R. Hines Jr.; Anna Gumpert; Monika Schnitzer (2016). "Multinational Firms and Tax Havens". The Review of Economics and Statistics. 98 (4): 714. Germany taxes only 5% of the active foreign business profits of its resident corporations. [..] Furthermore, German firms do not have incentives to structure their foreign operations in ways that avoid repatriating income. Therefore, the tax incentives for German firms to establish tax haven affiliates are likely to differ from those of U.S. firms and bear strong similarities to those of other G–7 and OECD firms. ^ "An Analysis of 2015 Corporation Tax Returns and 2016 Payments" (PDF). Revenue Commissioners. April 2017. ^ a b "IRELAND Trade and Statistical Note 2017" (PDF). OECD. 2017. ^ "FactCheck: How much do multinationals actually contribute in taxes?". thejournal.ie. 9 September 2016. ^ "Denouncing Ireland as a tax haven is as dated as calling it homophobic because of our past". Irish Independent. 21 June 2018. The total value of U.S. business investment in Ireland - ranging from data centres to the world's most advanced manufacturing facilities - stands at $387bn (€334bn) - this is more than the combined U.S. investment in South America, Africa and the Middle East, and more than the BRIC countries combined. ^ "Irish Taoiseach rebuts Oxfam claim that Ireland is a tax haven". Irish Times. 14 December 2016. But Mr Kenny noted that Oxfam included Ireland's 12.5 per cent corporation tax rate as one of the factors for deeming it a tax haven. "The 12.5 per cent is fully in line with the OECD and international best practice in having a low rate and applying it to a very wide tax base." ^ "'Ireland is not a tax haven': Department of Finance dismisses 'tax haven' research findings". thejournal.ie. 13 June 2018. Suggestions that Ireland are a tax haven simply because of our longstanding 12.5% corporate tax rate are totally out of line with the agreed global consensus that a low corporate tax rate applied to a wide tax base is good economic policy for attracting investment and supporting economic growth. ^ "Effective Corporate Tax in Ireland: April 2014" (PDF). Department of Finance. April 2014. ^ "Effective Corporate Tax calculations: 2.2%". Irish Times. 14 February 2014. A study by Dr Jim Stewart, associate professor in finance at Trinity College Dublin, suggests that in 2011 the subsidiaries of U.S. multinationals in Ireland paid an effective tax rate of 2.2 per cent. ^ "Pinning Down Apple's Alleged 0.005% Tax Rate in Ireland Is Nearly Impossible". Bloomberg News. 1 September 2016. ^ a b "Facebook Ireland pays tax of just €30m on €12.6bn". Irish Examiner. 29 November 2017. ^ a b "Oracle paid just €11m tax on Irish turnover of €7bn". Irish Independent. 28 April 2014. ^ Seamus Coffey, Irish Fiscal Advisory Council (18 June 2018). "Who shifts profits to Ireland". Economic Incentives, University College Cork. Eurostat’s structural business statistics give a range of measures of the business economy broken down by the controlling country of the enterprises. Here is the Gross Operating Surplus generated in Ireland in 2015 for the countries with figures reported by Eurostat. ^ "Territorial vs. Worldwide Corporate Taxation: Implications for Developing Countries" (PDF). IMF. 2013. p. 4. ^ a b "How Tax Reform solved UK inversions". Tax Foundation. 14 October 2014. ^ a b "The United Kingdom's Experience with Inversions". Tax Foundation. 5 April 2016. ^ a b TF Editorial (13 November 2012). "Japan Disproves Fears of Territorial Taxation". Tax Foundation. ^ a b Philip Dittmer (10 August 2012). "A Global Perspective on Territorial Taxation". Case Studies of transitions from "Worldwide" to "Territorial"
^ "How to stop the inversion perversion". The Economist. 26 July 2014. ^ a b Kyle Pomerleau (3 May 2018). "A Hybrid Approach: The Treatment of Foreign Profits under the Tax Cuts and Jobs Act". Tax Foundation. ^ Kyle Pomerleau (13 March 2018). "Inversions under the New Tax Law: Carrot and Stick". Tax Foundation. ^ a b Haynes and Boone LLP (9 March 2018). "Tax Reform - Considerations for U.S. Multinationals". Lexology. ^ Lewis J. Greenwald; Witold Jurewicz; John Wei (23 April 2018). "Reassessing the Beloved Double Irish Structure (as Single Malt) in Light of GILTI". DLA Piper and TaxNotes International. ^ a b Amanda Athanasiou (19 March 2018). "U.S. Tax Cuts and Jobs Act: Corporate tax reform - Winners and Losers". Taxnotes International. p. 1235. ^ Cliff Taylor (30 November 2017). "Trump's U.S. tax reform a significant challenge for Ireland". Irish Times. ^ Suzanne Lynch (17 January 2018). "U.S. corporations could be saying goodbye to Ireland". Irish Times. ^ Suzanne Lynch (29 November 2017). "Donald Trump singles out Ireland in tax speech". Irish Times. ^ Niall O'Connor; Colm Kelpie; Laura Larkin; and Brian Hutton (11 November 2017). "'Flood of companies' to leave Ireland due to U.S. tax cuts". ^ Mihir A. Desai (26 December 2017). "Breaking Down the New U.S. Corporate Tax Law". Harvard Business Review. So, if you think about a lot of technology companies that are housed in Ireland and have massive operations there, they’re not going to maybe need those in the same way, and those can be relocated back to the U.S.
^ "Vantiv decides against Inversion". Bloomberg News. 10 December 2017. ^ Gavin McLaughlin (31 August 2018). "U.S. tech firm leaves Ireland for U.S. after Trump tax cuts". Irish Independent. ^ Michael Erman; Tom Bergin (18 June 2018). "How U.S. tax reform rewards companies that shift profit to tax havens". Reuters. ^ Mihir A. Desai (June 2018). "Tax Reform: Round One". Harvard Magazine. ^ Ben Harris (economist) (25 May 2018). "6 ways to fix the tax system post TCJA". Brookings Institution. ^ Brad Setser (30 July 2018). "Gone Fishing". Council on Foreign Relations. [..] most of the profits booked by U.S. firms abroad continue to appear in a few low tax jurisdictions, and well, the resulting data distortions are getting pretty big. I am pretty confident the U.S. tax reform didn't solve the issue of profit-shifting. 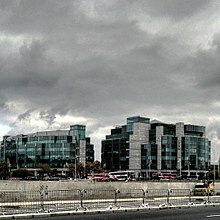 ^ "Google, Facebook and Salesforce.com dramatically expand their Dublin office hubs". Irish Independent. 26 July 2018. ^ "IRELAND SELECTED ISSUES Section E: The U.S. Tax Reform". IMF. 11 June 2018. pp. 27–33. ^ Eoin Burke-Kennedy (12 September 2017). "Seamus Coffey: Strong Irish corporate tax receipts 'sustainable' until 2020". Irish Times. ^ Brad Setser, Council on Foreign Relations (6 February 2019). "The Global Con Hidden in Trump's Tax Reform Law, Revealed". New York Times. Retrieved 24 February 2019. ^ "Ireland's playing games in the last chance saloon of tax justice". Richard Murphy. 4 July 2018. Local subsidiaries of multinationals must always be required to file their accounts on public record, which is not the case at present. Ireland is not just a tax haven at present, it is also a corporate secrecy jurisdiction. ^ "Pinning Down Apple's Alleged 0.005% Tax Rate Is Nearly Impossible". 1 September 2016. ^ Peter Bodkin (19 March 2019). "How the IDA's top client used Ireland to siphon billions offshore tax-free". TheJournal.ie. Retrieved 19 March 2019. Meanwhile, through a myriad of subsidiaries and system of inter-company charges involving a variation on the infamous so-called ‘double Irish’ structure, its local operations have also legally shaved their tax bills with the Exchequer despite pulling in huge sales. ^ "Abbott Laboratories Irish subsidiary paid no tax on €1.8 billion profit". The Irish Times. 31 May 2013. ^ "Abbott subsidiaries paid no tax on €2.9 billion profits". Sligo Today. ^ a b c d e f g Chitum, Ryan (2007). "How 60 billion are lost in tax loopholes", Bloomberg. ^ "The Sharing Economy Doesn't Share the Wealth". Bloomberg News. 6 April 2016. Retrieved 7 April 2017. ^ "Low Irish taxes boost Airbnb profits". EURACTIV. 22 July 2014. Retrieved 7 April 2017. ^ a b c d e Jesse Drucker (21 October 2010). "Google 2.4% Rate Shows How $60 Billion Lost to Tax Loopholes – Bloomberg". www.bloomberg.com. ^ "'Double Irish' limits Facebook's tax bill to €1.9m in Ireland". Financial Times. 5 December 2013. ^ "Facebook paid just €30m tax in Ireland despite earning €12bn". Irish Independent. 29 November 2017. ^ Paul O'Donoghue (26 December 2018). "US pharma giant Gilead uses 'Double Irish' tax loophole". The Times. ^ "Google's 'Dutch Sandwich' Shielded 16 Billion Euros From Tax". Bloomberg. 2 January 2018. ^ "IBM gooses its sales numbers thanks to overseas tax tricks". ARS Technica. 4 February 2014. ^ "Medtronic's $43 Billion Covidien Buyout Is More Than Just A Tax Saving Deal". Forbes. 14 June 2014. ^ Glenn R. Simpson (7 November 2005). "Irish Subsidiary Lets Microsoft Slash Taxes in U.S. and Europe". Wall Street Journal. Round Island's legal address is in the headquarters of a Dublin law firm, Matheson Ormsby Prentice, that advertises its expertise in helping multinational companies use Ireland to shelter income from taxes. ^ "TAX JUSTICE NETWORK: Irish Subsidiary Lets Microsoft Slash Taxes in U.S. and Europe" (PDF). Tax Justice Network. 7 November 2005. ^ "Corporate Tax 2014: Yahoo! joins "Double Irish Dutch Sandwich" club; IDA Ireland wants more members". FinFacts Ireland. 10 February 2014. Drucker, Jesse (13 May 2010). "U.S. Companies Dodge $60 Billion in Taxes With Global Odyssey". Bloomberg. Archived from the original on 1 July 2010. Retrieved 21 February 2019. An illustration of the "Double Irish Dutch Sandwich". Australian Broadcasting Corporation. This page was last edited on 23 April 2019, at 03:24 (UTC).